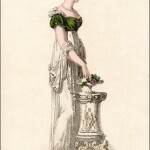 Fashions of London and Paris, March 1806. The prints in this publication were never as fine as its more expensive rival magazines, but I have always found them to have a certain charm. 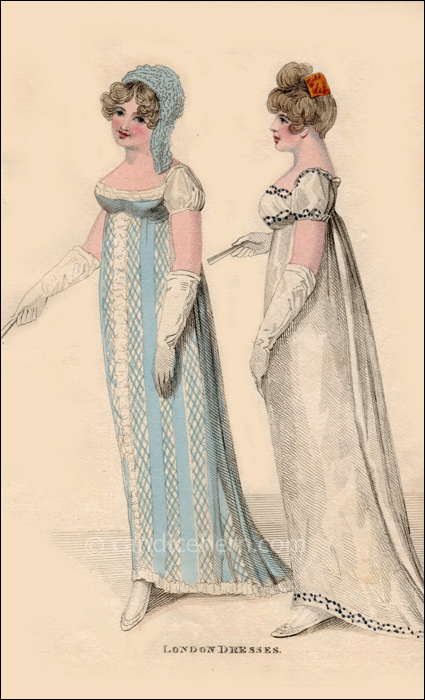 Even though the engraved designs are fairly simple, the description leads one to believe these dresses must have been quite striking in person. The blue muslin with inset lace stripes sounds gorgeous, and the simple white gown is made of satin and trimmed with beads. Not simple at all. “Fig. 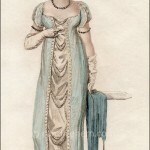 1.–A dress of lace-striped blue muslin over an under dress of white satin. The front and bottom of the dress, trimmed with reverse plaitings of white satin riband. The sleeves of white satin, very short. and rather full. 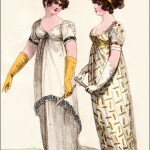 The bosom quite plain and trimmed so as to correspond with the other parts of the dress. A turban of blue and white chenille. White gloves and shoes.